Everest Academy: Oct. 7 Deadline: Calling all budding scientists, mathematicians, and filmmakers from around the world! Oct. 7 Deadline: Calling all budding scientists, mathematicians, and filmmakers from around the world! Calling all budding scientists, mathematicians, and filmmakers from around the world! From now until October 7, Khan Academy and Breakthrough Prize are seeking video submissions that explain a challenging and important concept or theory in mathematics, life sciences, or physics. 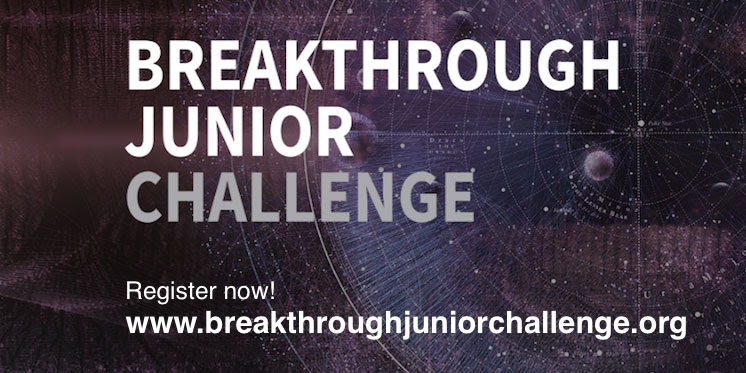 If you’re between 13 and 18, and you have a passion for explaining ideas and concepts creatively, you can enter the Breakthrough Junior Challenge! Not only can you dig into a topic that you’re passionate about, but there are also great prizes to be won, including a $250,000 scholarship for you, a $50,000 award for your teacher, and a state-of-the-art $100,000 science lab for your school. The winner will also be invited California, where the prize will be awarded in front of the superstars of science, Silicon Valley, and Hollywood. If you enter, you’ll view and assess other participants’ videos in a peer-to-peer review process. Submissions will then be assessed by leaders in science, technology, and education selected by Khan Academy and by Breakthrough Prize laureates. The judges will select a winner based on how engaging, illuminating, and creative their video is, and how challenging the concept is to understand. The deadline for submissions is October 7, so register today at www.breakthroughjuniorchallenge.org. We hope you’ll be inspired to get involved - and share your passion for understanding the world! If you'd prefer not to receive these types of emails from me, unsubscribe here. P.S. You can find all the details at www.breakthroughjuniorchallenge.org. Learn more today.